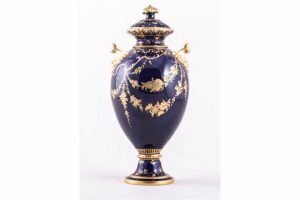 A Royal Crown Derby bone china royal blue ground urn shape covered vase, 1895, with scroll handles, tooled gilt decorated of swags. 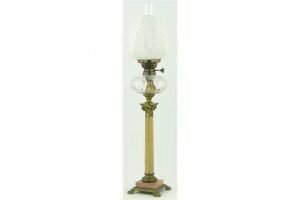 A Victorian coloured marble and brass Corinthian column oil lamp, with cut-glass vessel and embossed milk glass shade. 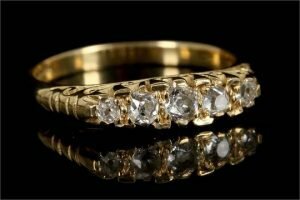 An 18 carat gold and diamond three stone ring, the round brilliant cut diamonds of good colour and clarity estimated to weigh approx 0.26 carat total. 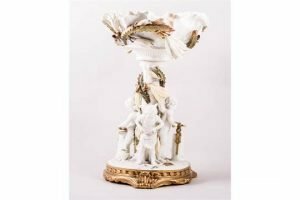 A Staffordshire porcelain ornamental comport, Moore of Longton, circa 1880, shaped bowl encrusted with lilies, the column surrounded by three cherubs forging Love’s arrow, scrolled foot. 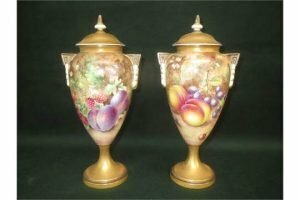 A pair of Royal Worcester bone china, urn shaped vases and covers, each painted with fruit, on a mossy ground. 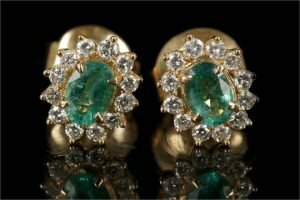 A pair of 18ct yellow gold, emerald and diamond cluster earrings. 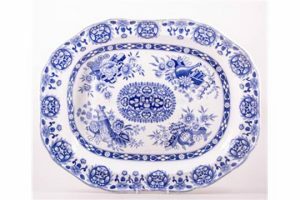 A Copeland and Garrett transfer ware meat plate, circa 1840, decorated with oriental objects and flowers. 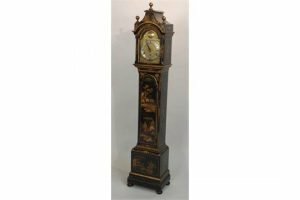 An early 20th Century Japanned grandmother clock, the arched brass dial with silvered chapter ring, engraved with Roman numerals, with Westminster chime, the case decorated in raised gilt, with oriental scenes of figures, buildings, trees etc., on bun feet. 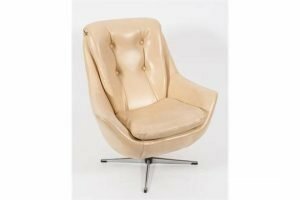 A 1960’s button back swivel armchair, upholstered in cream faux leather, having a cushion seat, on chromium cruciform base. 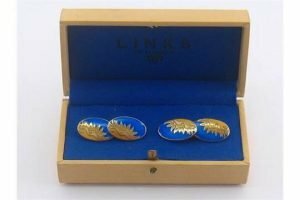 A pair of silver gilt and enamel cufflinks by Links of London, in Links of London case. 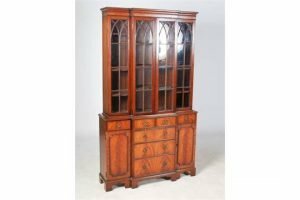 A reproduction mahogany breakfront bookcase in the George III style, the moulded cornice above four astragal glazed cupboard doors opening to fitted interiors with adjustable shelves, on a base fitted with four frieze drawers above a brush slide and three long graduated cockbeaded drawers, flanked by cupboard doors, raised on bracket feet. 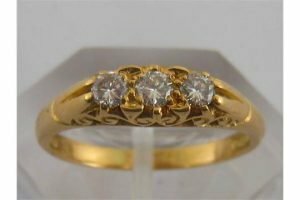 A Victorian 18ct yellow gold and diamond graduated five stone ring, the old cut stones over a pierced scroll work gallery. 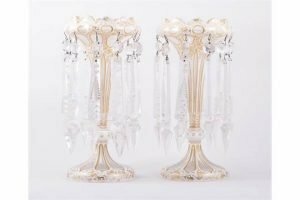 A pair of Victorian overlaid glass lustre vases, conical stems, bottom knopped, gilt foliate decoration, with a white ground, each with ten prismatic lustre drops. 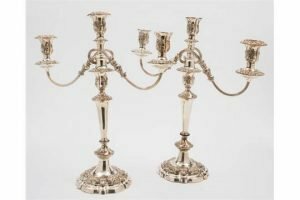 A pair of 19th century plated twin-branch candelabra, with foliate decorated urn-shaped nozzles and sconces, on reeded branches issuing from a knopped and tapering stem on a domed and weighted circular base. 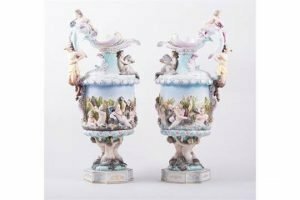 A pair of Capodimonte style ornamental ewers, 20th Century, moulded decoration with figures, sea horses, dolphins and frolicking cherubs. 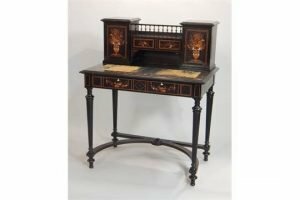 A late 19th Century Continental ebonized and marquetry bonheur du jour, the raised back with a gallery and two drawers, flanked by two doors, each decorated with vases of flowers, on a parquetry ground, the base with a leather inset, a moulded edge and a frieze drawer, on turned and reeded tapering legs, with shaped stretcher and turned feet. 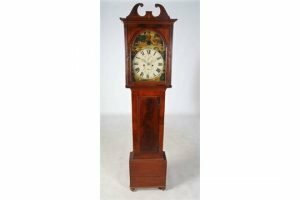 A 19th century Scottish mahogany longcase clock, the enamelled dial with Roman numerals, subsidiary seconds and date dials, enclosed within a rectangular hood with broken swan neck surmount, the trunk with rectangular door, on a rectangular base with bun feet. 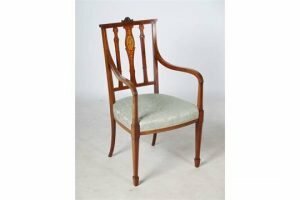 An Edwardian mahogany and marquetry inlaid armchair, the back inlaid with an oval panel of cherub above a blue upholstered seat, flanked by brass lined arms, raised on tapered square supports with spade feet. 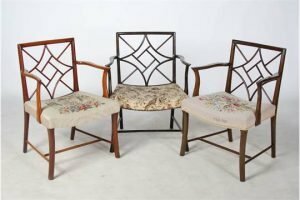 A set of three early 20th century mahogany Cockpen elbow chairs, two with concave needlework upholstered seats, one with cockatoo and floral upholstered seat. 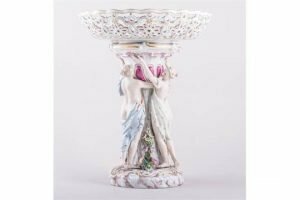 A Meissen porcelain comport, modelled with the three Graces, pierced shallow bowl, painted with a floral spray, domed base with Rococo scrolls.